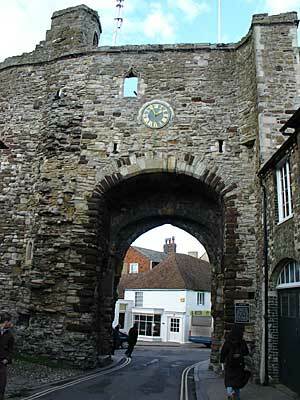 A town wall was built around Rye in the 14th Century, stretching from Land Gate to Strand Gate (now demolished) at the bottom of Mermaid Street. Land Gate was built in 1380 to help defend the exposed northern side of the town, and features two massive drum towers, some 40 feet high. The pointed (north) archway was closed by a portcullis, the grooves of which are still visible. There was also a drawbridge.